PEAK COLOR - 10 VIEWS TO TAKE YOUR BREAK AWAY! Grand Portal Point, Pictured Rocks. Head on a gorgeous, pinch-me-I’m-dreaming tour across the forest and waters (and waterfalls!) of our special place on earth. Dave Karczynski takes you inside a long camp tradition on an unforgettable riverine adventure in the U.P. Behind the scenes with the Traverse City storytelling show that melds work- and life-purpose. THRILL RIDE As fall colors blaze, head to the Grand Traverse Commons to spin the mountain bike trails in the hilly forest. TALE OF 2LADS Tim Tebeau profiles the wine “makers and shakers” of this top-flight Northern Michigan winery. The Northern Home & Cottage Kitchen and Home Tour, 10 homes including home in Traverse City, Old Mission Peninsula, Glen Arbor, Leland, and MORE! Up North - Happy news from Suttons Bay, Sleeping Bear Dunes and Elk Rapids. This Is MyNorth - Hang out with us online, on social and at MyNorthTickets. October Events - Fall fun, coming your way. Travel - Wine taste like a pro (for real). Up in Michigan - What it’s like to be a ghost-tour guide on Mackinac Island. Dining - Color tour hikes and eat spots. Local Foodie - Make a pot of this pumpkin chili and make some friends. Drinks - Red wines to try now. Outdoors -Trail run in the fall splendor. For Land and Water - See the champion trees at Lake Bluff Bird Sanctuary. I am fond of saying that Northern Michigan has long been a region made up of dreamers, people seeking a life of balance and willing to take the risks involved in starting or working for new enterprises. I’ve loved telling the stories of some of our earliest fruit farmers who, traveling by ship and against all odds, and often with peril, threw their lot in with our land. In the years before I ever started the magazine, in Traverse City alone, it was entrepreneurs who stood to benefit from waterfront development, yet fought to preserve what became the Open Space. 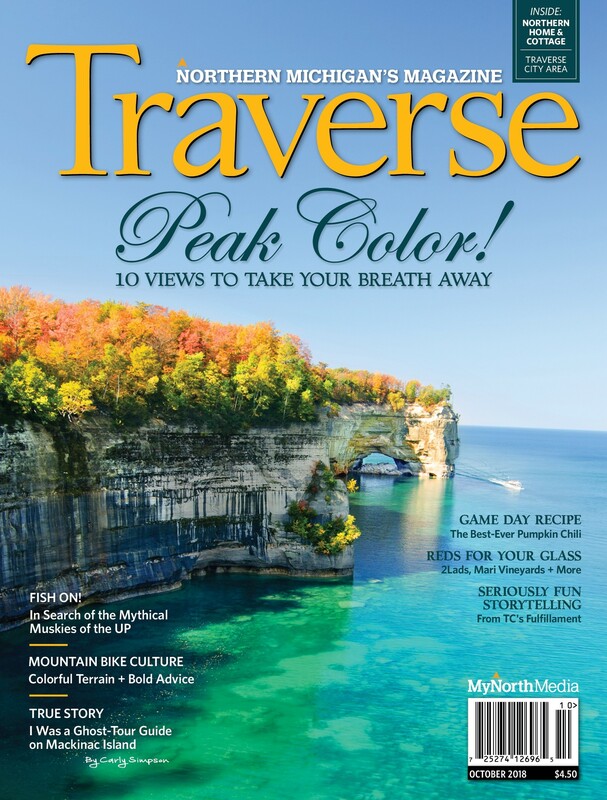 ... Read the rest of Deborah Wyatt Fellows's column in the October 2018 issue of Traverse, Northern Michigan's Magazine.